teeka asks badami is Gulfamkali your real sister, badami says i was about to born when my mother married her father. teeka gets confused, Badami has something in her eyes,teeka helps her, Angoori mistakes it and scolds them, Vibhuti wishes angoori good morning, tiwari asks whats wrong,angoori says these two where kissing in public,shameless people,vibhuti scolds them,teeka tries to defend but gets scolded, master asks whats wrong,tiwari scolds master too,vibhu says teeka was making out with Badami, teeka tries to defend, Badami leaves,master whacks teeka. Laddu greets angoori, angoori asks where is amaji, laddu says she is out fighting with a guy who tried to overtake our auto, Angoori rushes out and saves the guy and takes amaji in. laddu says i will go visit Arnav. Tiwari greets amaji, amaji scolds tiwari on not having babies yet, tiwari says its not in our hands we are trying, amaji sagd says enough do what i say now,pandit Rampal asked you two be romantic in public, Angoori blushes,amaji says the more people see you the more you will be benefited, Tiwari says but amaji, amaji says shut up dare you cross me. prem and vibhu judge people on public display of affection, vibhu shares the morning incident of teeka, prem asks which girl,vibhu says with badami, prem says what did she see in him are we dead, vibhu says how cheap, Prem says oh what about you,and angoori bhabhi,vibhu says shut up its one sided love and bhabhi is dignified women she caught teeka and scolded her,tell me have you ever seen her getting touchy in public with tiwari,prem says never you are right,sacena comes and insults vibhu, prem asks why are you dressed in skying outfit,saxena says its snowing in ladakh so and leaves. Anu reading magazine, and says my vibhu is not like meb described here,hapu visits her,Anu asks how come here, hapu says not good im disturbed after hearing about yiur accident, Anu says yes anyways will you have tea,Hapu says sure,Anu says okay go in kitchen make yourself a tea and me a cup of coffee and wash utensils too go. Prem and vibhu having drinks,prem says my wife wants to visit kullu and enjoy snow,vibhu says go now, prem says i dont enjoy but,vibhu says dont lie i know last year you visited with Gulfamkali and enjoyed a lot. Prem says ofcourse i love her,but wife i hate, vibhu and prem start praising angoori for her decency. tiwari and Angoori come out, angoori says i want to kiss you,tiwari says go ahead. Prem and vibhu shocked, prem enjoys seeing them, vibhu says stop it, prem says we are having free show and look how angoori bhabhi is no more praising her, come let’s have one more peg.vibhu says get out, vibhu has a drink. teeka in pain,and curses master, tiwari and angoori kissing around, boys see them and are in shock, teeka says no body scolded me where as i did nothing and got whacked. Pre cap: Vibhu and Prem see Tiwari and Angooris kissing again. 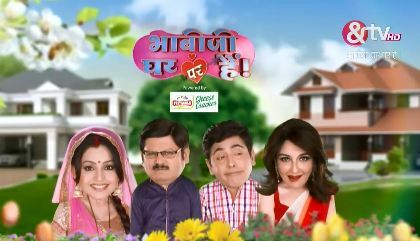 The post Bhabhi Ji Ghar Par Hai 25th February 2019 Written Episode Update Tiwari and Angooris public display of affection appeared first on Telly Updates.